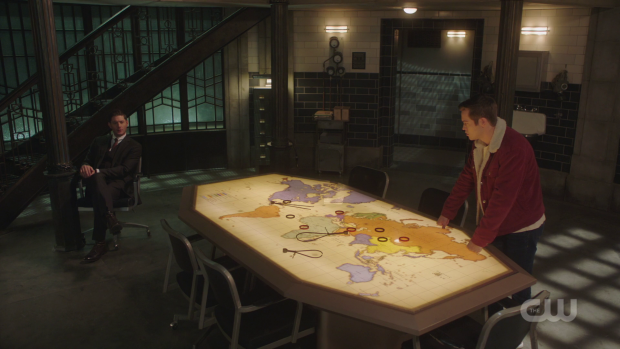 Supernatural returns from hiatus to deal with Michael’s repossession of Dean and his plan to unleash his army of monsters on an unsuspecting city. I said in my last review that the budget limitations this show has would likely prevent the visualisation of Michael’s monster army attacking a city and unfortunately I was right. This episode does a lot of things right but making the monster threat feel significant isn’t one of them. All that is really delivered is Maggie talking to Sam on the phone about reports of attacks that are never shown. Similarly Maggie and her group of Hunters are to to stall the oncoming horde of monsters which amounts to them standing on an empty road looking scared. Scope has never been this shows strong suit and the attempt to establish a large scale threat in this episode simply doesn’t work. It’s more laughable than anything else and does nothing to raise the stakes. That almost doesn’t matter as everything else about the episode worked so well. Opening the episode with Dean running a bar and hanging around with Pamela Barnes was an effective shock considering the expectations raised by the previous episode. It was immediately clear that this was all in his head because there have been several examples of this in the past but going straight for it was a nice touch. Pamela Barnes was a strange choice as she’s a really deep dive as characters go. She hasn’t been seen in almost a decade and it took me a while to remember who she was. Granted the episode helps to some degree through flashbacks to her earlier appearances but asking audiences to remember a character who made two appearances such a long time ago is a big ask. It’s a testament to the longevity of the show that there are so many side characters from years ago that can be reintroduced in creative ways such as this but it does get difficult to remember them when they haven’t been seen in a number of years. Dean’s bar fantasy delivers a side of Dean we don’t often see. Contentment is always just outside of his reach so it’s interesting to see what happiness looks like for Dean. Running a small town bar that he proudly keeps open despite the fact it’s going under feels appropriate for Dean and Jensen Ackles does a great job portraying him without the weight of responsibility on him. The time loop scenario is something I could take or leave but it’s all in service of offering him an opportunity to realise that it isn’t real, almost as if his mind is trying to help him break free of Michael’s influence. This episode was generally a great showcase of Jensen Ackles’ acting talents. 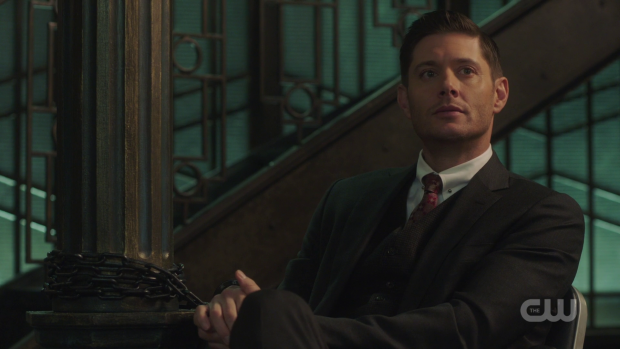 He basically plays three different characters here with two of them being variations of Dean. His version of Michael is always a delight with the casual arrogance and intimidating demeanour. Even though he is handcuffed and apparently no longer dangerous he doesn’t lose his edge. The early scene where monsters were banging down the door and he was making light of the situation was excellent and his repeated attempts to get to the other characters made for some great character beats. Michael’s access to Dean’s memories gives him a lot to work with in terms of undermining the other characters. He tells Jack that Dean only appeared to be upset that he was dead on the outside but was secretly glad. This is so clearly untrue but it doesn’t stop Jack from taking notice of it and I would be willing to accept that Dean might be glad that he has one less person to worry about but there’s no way he’d be glad that Jack is dead after accepting him into his life. It’s enough to make Jack think and distract him briefly though and it’s clear that Michael takes joy in watching him squirm. We also learn a bit more about Michael and what motivates him. His motivations are similar to Lucifer early on in that he resents God and is acting out as a result. Michael’s plan is to basically ruin God’s creating until he takes notice and intervenes which would give Michael the chance to kill him. As motivations go it’s somewhat weak because we’ve basically seen it before with Lucifer but there is interesting undertones to it that tie into the common Supernatural theme of fathers shaping sons in both positive and negative ways. Michael’s interpretation of how God approached the universe was really interesting and starts to answer a few questions about why parallel universes can exist at all. There was always the lingering question over whether God created them all or if each universe had a version of God. According to Michael, God created them all and suggests that God is nothing but a writer who changes the story every time he fails which makes every universe a different draft of the same book in essence. I really like this idea as it offers a reasonable explanation for why God is absent most of the time while allowing the other universes to exist without too many questions being raised. Why God abandons universes he considers to be failures is something that needs to be explored as there is definitely another side to this argument but for now it makes sense for Michael to see things this way. Finding out that there are other universes has made him think that God doesn’t actually care about him or anything else in his world so he’s content to destroy every parallel universe he can get his hands on to get back at his father. With some work this could be a great character arc for Michael and should become more compelling if God returns to give his take on the situation. Sam and Castiel’s trip into Dean’s head works really well as it allows for a confrontation with Michael that has more balanced power levels. Taking on an Archangel in the real world would be fairly ludicrous but inside Dean’s head anything goes and it allows Michael to experience vulnerability. He continues to try his intimidation tactics by telling them that he knows the real Dean and that he hates them because he feels responsible for them. This allows Cas to realise that Michael is stalling which also makes for a quick confirmation that Cas can’t be dissuaded from the notion that Dean cares about him and Sam. After this Michael’s only option is threatening to destroy Dean if he is forced out which leads Dean to lock Michael inside his head and become his cage. Of course this won’t end well for him as per the end of the episode where he struggled to silence Michael who is violently trying to break down the walls of the cage and secure his release. It could end up being a repeat of the manifestation of Lucifer in Sam’s head from a while back but Michael is different enough as a character for me to be intrigued enough. This episode also brings in some foreshadowing by way of the Reaper involvement. Sam asking for help from Jessica because she is permanently assigned to watching over them is a fairly contrived escape though it’s probably the only way out of the corner that the characters have been written into at that point. 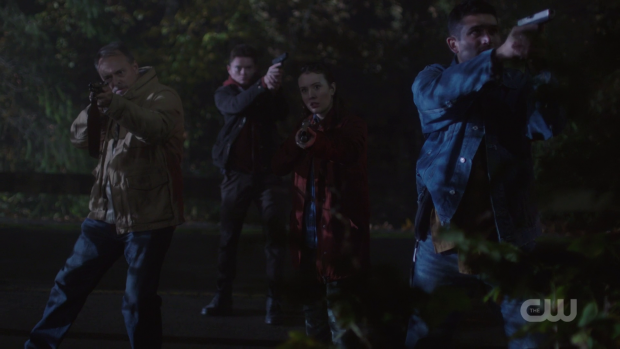 The idea that the Reapers have to work in shifts because Sam and Dean are such a nuisance to them is definitely amusing but there’s a risk that this could be leaned on to get the characters out of tough situations in the future. Billie’s appearance is where the foreshadowing kicks in. She references the reading room that chronicles every possible way he could die that was last seen in “Advanced Thanatology“. The problem is that every book except one says the same thing now that Dean has trapped Michael. Dean is shown the book that has the different ending and looks terrified at the prospect. Unfortunately the audience is left to speculate until a later date. The Avengers: Infinity War comparisons are surely no accident at this point considering the previous episode ended with a snap and this one details a single scenario where victory is possible. It’s an effective tease though may not live up to the generated hype. A strong episode that makes great use of Jensen Ackles’ acting ability and presents some effective foreshadowing. Dean being trapped in a time loop of personal contentment was an engaging way to start the episode as it gives a rare look at what a happy life would be for Dean. His performance as Michael outside of that was excellent and the way he tried to get under the skin of the other characters by twisting the truth was excellently handled. The insight into his motivations feels a little bit familiar but there is a lot of potential for further exploration especially if God comes back into it. Dean trapping Michael inside his mind also feels somewhat familiar but it could continue to be interesting because of how different Michael is from Lucifer in general. Billie foreshadowing the single scenario that doesn’t end with Michael using Dean as his vessel and ending the world generates some hype for the coming episodes though it’s always possible that the reveal won’t live up to it. This episode massively drops the ball on establishing the scale of the problem. Michael’s monster army attacking the city doesn’t feel like a huge problem as there’s no attempt to visualise it. All that happens is Maggie talks about it so it’s difficult to invest in the problem since it’s never actually seen. The approach becomes more laughable the longer it goes on and serves as a reminder of this show’s difficulty showing large scale problems.